Mary Kay was hired December 1, 1998, by Dr. Geoff Hammond for the position of Administrative Secretary, a part time position. She began full time employment September 19, 2009, fulfilling both Administrative and Financial Secretary positions. She married James Weathers October 11, 1975, and has two married children, five grandsons and one grandaughter. Their daughter, Jenn, and husband, Tommy, live in Keller Texas and have 3 children, Mark, Owen and Grant. Their son, JD and wife, Mariann, live in Ft. Mill, SC, and have 3 children, Logan, Jackson and Hadlie. Most all of their travel time is visiting grandchildren! Mary Kay has been active in the Association of Arkansas Baptist Secretaries (AABS) since 2000, serving as Area Representative for 2 years and Secretary/Treasurer for 4 years. 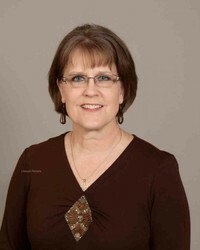 She is also a member of the National Association of Southern Baptist Secretaries (NASBS) since 2005. She completed LifeWay's Professional Certification class on April 28, 2004. If you are interested in these professional secretaries associations, please email or call Mary Kay.